Review posted February 13, 2015. Scholastic Press, 2014. 391 pages. Why in the world was I thinking this is a trilogy? All along, they carefully called it The Raven Cycle, not The Raven Trilogy. Yes, some extreme things happened in this book, but they just inched the plot further along, rather than wrapping things up, as I had hoped. I'm not crazy about this series -- It's a darker story, with more occult elements, than I usually like. But I can't look away! And I've come to care about the characters. I've even come to believe in a romance between Blue and Gansey -- and that took some skilled writing! This cycle of books is like no other fantasy I've ever read. We've got a bunch of entitled rich kids and their scholarship friend and a girl from the hills looking along a ley line in West Virginia for a buried Welsh king. And all sorts of amazing supernatural things are happening while they're looking. In some ways, this felt like a bridge piece. It wasn't as striking as either the first or the second book. And the characters were dealing with consequences from the second book, looking for Maura, and getting much closer in their quest to find the sleeping king. There's not a lot I need to say. If you've read the first two books, this strings you along with more of the same. 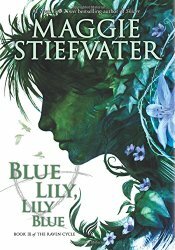 Maggie Stiefvater is an amazing writer, and manages to make her crazy world seem plausible, even as not a bit of the story is predictable. I may not be crazy about this series, but one thing's for certain: I will be reading the next book as soon as it comes out.